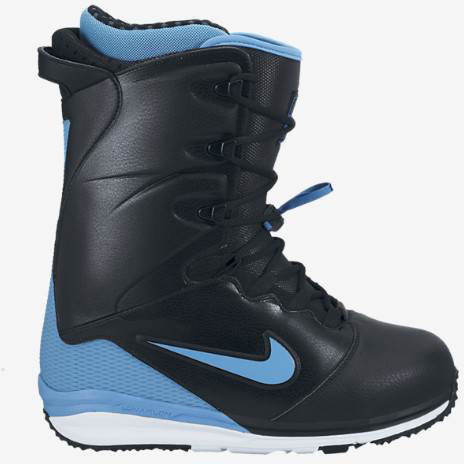 The Nike Lunarendor is the continuation of the Zoom Ites but has a huge improvement in shock absorption technology. So on the outside it looks very familiar but on the inside there is a new type of ride. Flex: Pretty stiff. It’s not the stiffest of the stiff but it’s definitely in the stiff category. It’s got three ways you can adjust the flex of the boot. 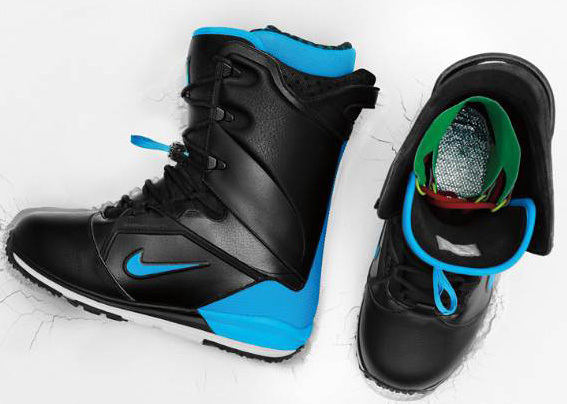 It comes with 2 different types of boomerang type inserts that allow the boot to flex differently. So you can go without any boomerangs in for more of a medium flex. Then you can add the pink boomerangs in for a med/stiff flex and then you can add the blue ones in for a more stiff flex. 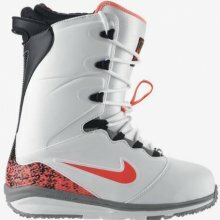 So it’s a pretty versatile boot for those that ride a few different boards. So I’m putting the flex at Med/stiff but you can make it stiff or medium. Comfort: It feels just like the incredibly comfortable Zoom Ites and feels like it wraps perfectly around my foot. It’s a little tight in the toe box for some (not for me) and some wider footed riders aren’t that into Nike boots but most will love the comfort these provide. 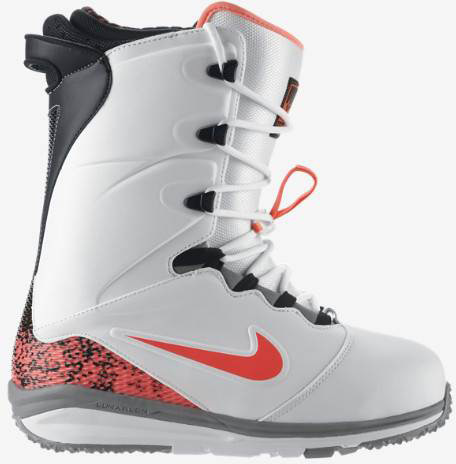 Heel Hold: I’ve never had issues with Nike boots and heel hold. My feet didn’t move at all inside these boots and they felt like part of my heel. You don’t have to tighten up the boots (at least i didn’t) and I really liked that. 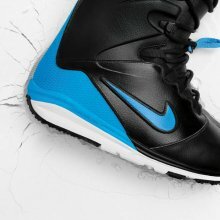 Adjustability: There is something really appealing to the higher end Nike lacing system. It’s got that easy lace system in the liner that looks like traditional lace but doesn’t act like it. 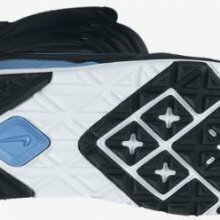 Then on the outside it has that harness right above the ankle that allows you the same upper/lower adjustability as speed lace. I love customizing your fit on the upper part too. I like leaving the top rung undone and just lacing up 2 rungs to have a less responsive feel for easier turning boards and also love to crank down all the top laces while leaving the bottom loose for riding more aggressive boards. Traditional lace might be slower but it’s got a lot of versatility. Flex Retention: With the Zoom Ite’s it did soften up after a while but it didn’t break down too much. The great thing is the added boomerang stiffeners you can add to the side of the boot that can keep it stiff a lot longer than most boots. I actually like the boot more as it get’s softer but if you want more of a Burton Driver X feel then you will like the boomerang. Response: Really good edge to edge and it’s got the same responsive feel as the old Zoom Ites. You see a guy in an urban setting on the Nike Website but the Lunerendor feels like it could attach to all kinds of boards from a freestyle ride to a freeride ride depending on how the inserts are used. It’s pretty versatile when it comes to response. Traction: Really solid traction and I love the way you can walk in the Lunarendor as well as the Kaiju. 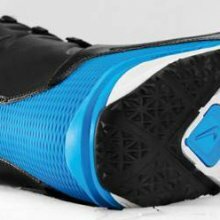 Shock Absorption: Some of the best in the business. Very shock absorbent and it makes your day easier without jacking up the profile. Footprint: The minute I got these I paired these up with my Burton Imperials and they were bigger but you could tell there was some reduction. 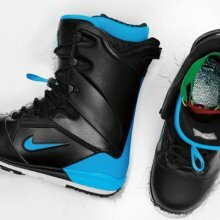 You can see from the pic that they are about 1/2 size bigger than Burton which is the leader in footprint reduction. On & Off Ease: It’s really hard to fault this traditional lace boot because they made this get on and off pretty easy. Most traditional lace boots are a pain to get on and off but these aren’t at all. All in all I was pretty impressed with these boots and I think they could work for a lot of riders that want response, adjustability and shock absorption. Also the fit my foot like a glove and most people who don’t have wider feet I’ve talked to agree. 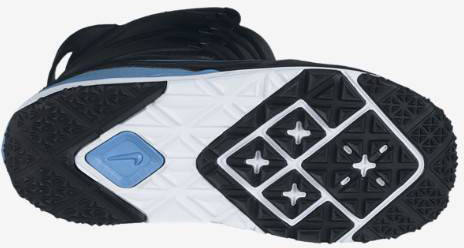 We try to get as many images of the Nike Lunarendor, but forgive us if they're not all there.